“Studying at the University of Plymouth definitely gave me the confidence to go on and develop a career within the environmental sector. I was absolutely blown away with the whole place on the open and applicant days, despite the torrential rain. After attending three or four other university open days before Plymouth’s it was just a massive step up in quality than anywhere else. The well-rounded nature of the course allowed me to access all areas of the sector, which I found essential as I wasn’t entirely sure where I wanted to go following my degree. “My course gave me so many practical, hands-on-skills which I use daily in my place of work which not many people can claim in their current roles, so that side of it is great. For me a placement was a great selling point of the course, the opportunity to go out for a year and gain valuable skills within the industry. I believe that without this placement I genuinely wouldn’t be where I am today! 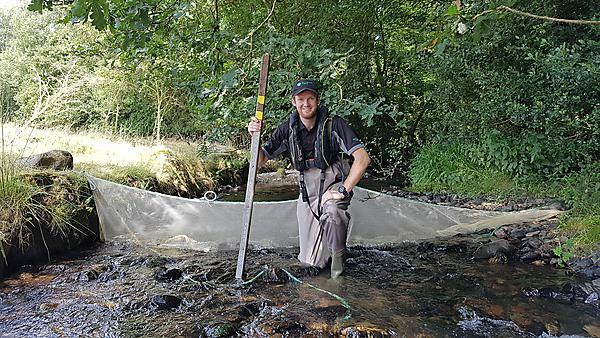 I wouldn’t have got my first temporary role with the Environment Agency (EA) as a summer assistant and as a result of this I joined the EA on a permanent basis after I graduated. Working with the EA I was responsible for collection of water samples from the sea and inland waters across Cornwall and West Devon. I got to wade out into the sea and take the sample before doing some analysis in the back of my van. It was also a great chance to get out an explore all of the most beautiful parts of Cornwall. I also took part in electric fishing surveys and a range of pollution incident management. “In a non-academic sense, playing in four varsity cricket events was a personal highlight. To be watched by so many people was great and the atmosphere was always incredibly loud! I was awarded Full Colours by UPSU for dedication and development to University of Plymouth Cricket Club. “After completing my studies I travelled to Australia for six months to play cricket. Upon my return to the UK I started back with the Environment Agency as an Environment Monitoring Assistant, after having previously worked for the EA in 2015. Find out how LABplus can enhance your field and laboratory skills.